My “rock” outfit consisted of a Nicole Miller Little Black Dress, Michael Kors booties, H&M fuzzy jacket, leopard scarf and a new pair of Trasparenze Claze Collants Capriccio Tights. Most people accessorize with jewelry, but I do it tights and scarves. This year, I collected over 50 pairs of tights! Love love love them. My favorite are by an Italian brand called Trasparenze Calze Collants, although pricey they are SO worth it! In Toronto you can get them at Legs Beautiful, or order on-line. They add a statement to every outfit: fun, flirty and with a little secret (they are prettier on the upper half). Was this a rock concert appropriate outfit: definitely not! But who cares, the most important part was that I felt fabulous! Another new discovery is Cazz shoes: a go-to pair for heel lovers! I carry them in my purse: great for after partying (wish I had them in Vegas ), in the library for switching out of heels, and for driving because I can’t drive in heels! They fold into a tiny purse! Yes, they are that thought out!!! I carry these babies around with me in the same way I carry my make up bag. You just never know when you need to touch up and you never know when your feet are going to get tired! I've also received some questions as to how I tie my leopard scarf. Here's how! Fold the square scarf into a triangle. Hold the two ends of the folded side and wrap around. Take one end and toss it over to the other side and do the same with the other side. The tie a knot underneath. I usually do not tie the knot only preferring a more disheveled look. 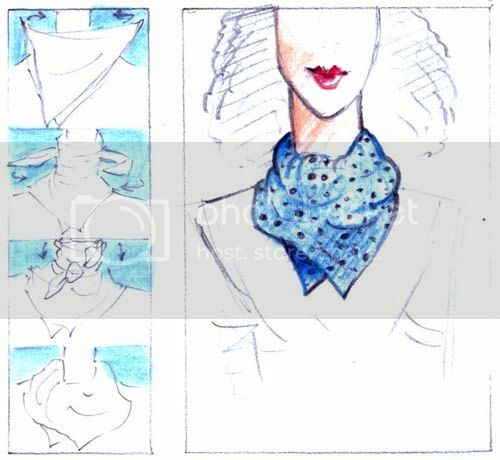 If you want to learn more check out this Scarf Tying Guide! P.S. Check out my post on Liv, it is all about knits… with runway inspiration and outfits. Wishing everyone a lovely day!!! !